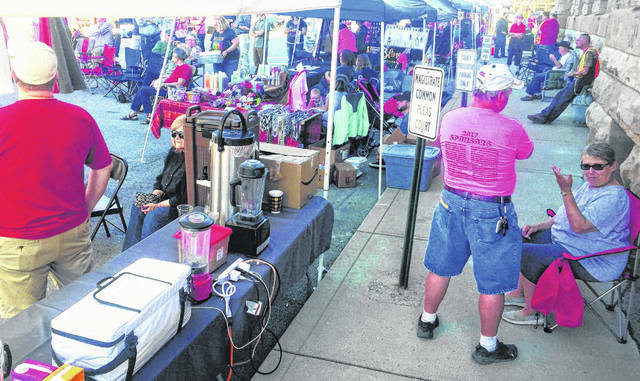 Shown in this photograph is a scene from last year’s Taste of Highland County held in the center of Hillsboro. The Hillsboro Uptown Business Assocation (HUBA) is seeking groups, organizations and individuals interested in participating in the third annual Taste of Highland County scheduled for Saturday, Oct. 13 on Governor Trimble Place and Governor Trimble Place in the center of Hillsboro. The event will run from 9:30 a.m. to 6:30 p.m.
Any group or individual that wants to set up a booth — using their own table, chairs, tent, etc. — free of charge, is welcome. For more information call 937-393-3456 and ask for Sharon or Ann, or call Sharon Hughes at 937-708-9443. There will be food for purchase, entertainment by local performers throughout the day, and fun family events. There will also be a free cruise-in with vehicles wanting to participate parked along North High and West Main streets around the Highland County Courthouse. The event sponsors are HUBA, the City of Hillsboro, Merchants National Bank, NCB and the Highland County YMCA.